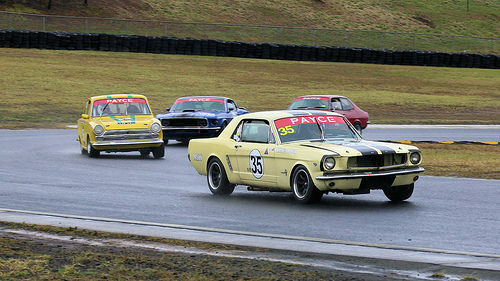 Historic racers at the Sydney Motorsport Park ~ MUSCLE CAR MASTERS ~ battle it out coming out of Turn 2. (1/3) Ian Mewett in the nice blue #55 351 Boss Fastback, leading Nathan Goulding in a Cooper S Mini #43. (2/3) Wayne Cooper in his "Group N" 1964 Ford Mustang leads StephenBeazley in the 1964 Cortina GT #316 out of the turn. (3/3) Jamie Tilley #28 in his familiar white/blue Mustang leading #189 Ben Wilkinson in the silver. Sydney Motorsport Park, New South Wales, Australia.